MNNIT Allahabad Notification 2018 Apply Online For 82 Non-Faculty Positions – Motilal Nehru National Institute of Technology Allahabad has published notification for employment of 82 Non Teaching post on contract basis. Interested and eligible candidates may apply for MNNIT Recruitment 2018 through online mode. The registration form is available from 07th August 2018. Applicants can fill their MNNIT Non-Teaching Vacancy Online Form till the last date 27.07.2018. The official site of MNNIT Allahabad is mnnit.ac.in. Furthermore information such as eligibility criteria, application fees, selection procedure & how to apply check below article properly. Here we mention all information related to Non-Teaching Vacancy. 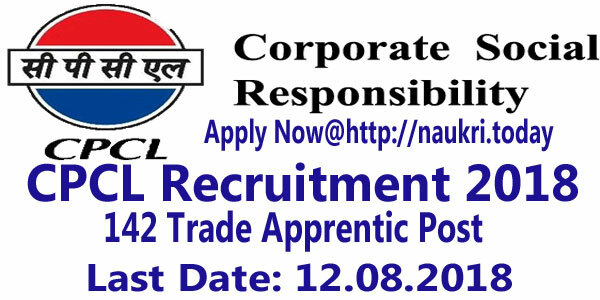 Dear Applicants, Motilal Nehru NIT is inviting online application for filling up 82 technical Manpower, Stenographer & other vacancies. This is a great opportunity for candidates those are searching MNNIT Allahabad Recruitment 2018. Those candidates who have qualified the given below eligibility criteria may apply online for nonteaching positions. Rest of details check below paras and read them carefully. How to Check Eligibility Criteria For MNNIT Recruitment 2017 ? what are the education Qualification and Age Limit for MNNIT Allahabad Job 2017? Candidates who willing to apply for MNNIT Allahabad Recruitment 2018 must fulfill eligibility conditions also. The below education qualification, experience and age limit are important factors to decide candidates eligibility. Therefore, all applicants must read given below eligibility conditions before apply for MNNIT Recruitment 2018. There is no minimum age required. Candidates should check official advertisement, which is mention below for details of the maximum age limit. Post wise upper age limit is mention on MNNIT Vacancy Notification. Maximum age relaxation is applicable as per govt. rules. For more refer MNNIT Vacancy Notification. Applicants who want to apply for MNNIT Allahabad Vacancy 2018 should complete their MBBS, Graduation, Post Graduation & other qualification. For Post, wise vacancy information is available on below Notification. Check it to ensure your education eligibility for MNNIT Allahabad Jobs 2018. Candidates will get select according to their marks secured in education qualification and according to experience. A merit list will prepare to select the candidates for MNNIT Non-Teaching Jobs 2018. First of all, candidates visit official site mnnit.ac.in. Download MNNIT Vacancy Notification from there. Read it carefully to check your eligibility. Now go to online application link for MNNIT Allahabad Recruitment 2018 Non-Faculty Positions. First, fill personal information for registration. Now login with your email id and password to apply for MNNIT Jobs 2018. Enter qualification, experience and other information on your online form. Submit your MNNIT Recruitment 2018 Application Form successfully. Take print of it for future uses. Conclusion: Motilal Nehru National Institute of Technology, Allahabad released notification for 82 Non Teaching positions. 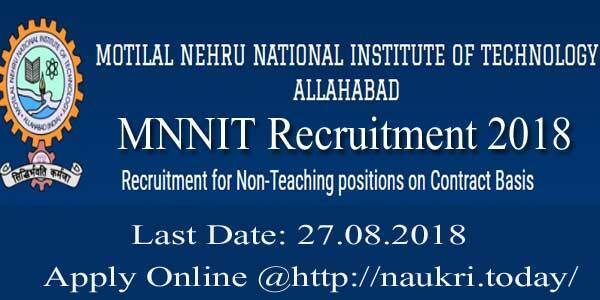 Apply Online for MNNIT Recruitment 2018 from 07.08.2018. The last date of filling online application form is 27.08.2018. Full information is available on the above article. Motilal Nehru National Institute of Technology, Allahabad has released an MNNIT Recruitment 2017 notification. 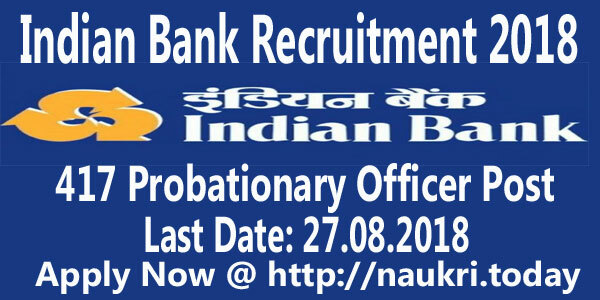 There is 92 posts of Internal Auditor, Technical manpower, and Various other vacancies. This is the good opportunity for all the candidate who is looking for MNNIT Allahabad Jobs 2017. Eligible and interested candidate can apply for the Offline Application form on or before the last date 13/04/2017. We are providing more details for MNNIT Vacancy Notification for 92 Internal Auditor, Legal Asst & Other Posts. About Motilal Nehru National Institute of Technology Allahabad, formerly Motilal Nehru Regional Engineering College is a public higher education institute located in Allahabad, Uttar Pradesh, India. MNNIT was Establish in 1961. As per the MNNIT requirement Institution has released Recruitment notification for 92 Vacancies. Those candidates who meet the eligibility Criteria can Apply for MNNIT Recruitment 2017 Jobs. More details for Educational Qualification, Age limit, Selection Process, Application Fee, How to apply etc. are given below section. Name of Vacancy: Academic Support Staff, Technical manpower and Various other. Age Limit for Allahabad MNNIT Jobs 2017 | Check Age for MNNIT Technical Manpower Post: MNNIT Allahabad has a different range of age limit for different Post. Post 1 : Candidate age should be below 70 Years for Internal Auditor Post. Post 2 to 11 : Applicant should be less than 35 Years. Code No. 12 : age should be below 40 Years for Senior Medical Officer Post. The participant who wishes to apply for MNNIT Recruitment 2017 Jobs should have complete Bachelor degree in Computer Science, LLB etc. and Master degree from recognized Institution and University. For details information about education, qualification check the Official Notification Link given below. MNNIT Allahabad Application Fee: Candidate Applying for MNNIT Allahabad job 2017 here is good news for them, there is no Fee for the application form. Selection of the candidate for MNNIT Allahabad Posts will be based on the Following Factor. Firstly Screening test will be taken by recruitment Committee only for the purpose of Short listening of Candidate. The screening test is totally based on Computer typing Skill. After Passing computer test candidate will be called for interview and Selection committee will ask Question-related to domain knowledge and at the end Merit list will be made of the Successful candidate. Details information for the selection process of the candidate given in notification. Candidates who are going to apply for Allahabad Motilal NNIT Vacancy firstly check all the eligibility criteria for education qualification, age limit from above. if you are eligible for the post follow the step given below for applying. Firstly the applicant should log on the official website i.e. mnnit.ac.in. On the home page click on jobs @ MNNIT option. Now Click on Non-Faculty Positions and open this link “ Advertisement No. 01/2017, dated March 24, 2017 Recruitment for Non-Teaching positions on Contract Basis” in the new tab. Further Read notification carefully and all the eligibility Criteria also. Download the Application form and fill all the details. Recheck all the details carefully for MNNIT Allahabad Faculty Jobs 2017. Affix your Passport size photo on the application form. Attach all the Education Qualification and experience document with the application form. Send this MNNIT Allahabad Faculty Vacancy 2017 Application form on the address given below. Conclusion: Allahabad MNNIT has announced for 92 posts of Internal Auditor, Technical Manpower . Eligible candidate can apply MNNIT Recruitment 2017 form before the last date 13.04.2017. Details Information about education qualification and other criteria check MNNIT Allahabad Faculty Vacancy 2017 article.